Find a therapist in Colorado with GoodTherapy.org. In 2015, the state of Colorado had a population of approximately 5.5 million people, according to estimates from the United States Census Bureau. The Bureau of Labor Statistics claims, of that total, roughly 33,410 residents worked in occupations involving community and social service. Typical jobs within this field included working as a guidance counselor, clinical social worker, therapist at a depression treatment center, child psychologist, religious worker, parole officer, or as a marriage therapist. In Colorado, residents working within these occupational fields earned an annual average salary of $47,590. The state of Colorado obtained an overall rank of 19th from the State of Mental Health in America survey conducted by Mental Health America (MHA) in 2016. 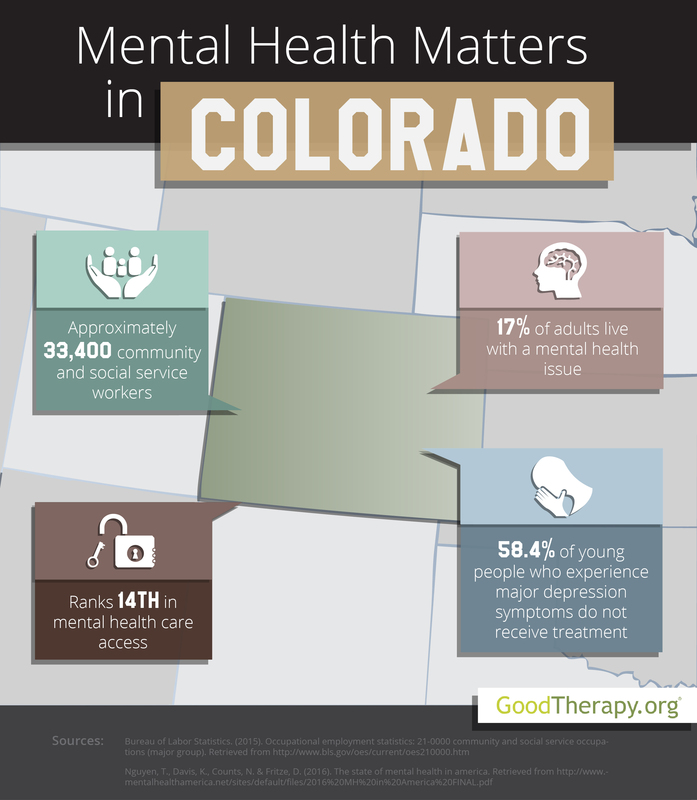 This overall rank illustrates how mental health conditions, resources, and practices in Colorado compare with those in the remaining 49 states and the District of Columbia. Data from the 2016 MHA survey suggests a relatively small percentage of adults in Arizona are affected by adverse mental health conditions. The state ranked 7th in this category, with only about 17% of adult residents reporting emotional, behavioral, or psychological issues. According to health care analysts, mental health professionals, and therapists in Colorado, one major factor that correlates with this ranking is the relatively low rate of obesity among men and women in the state. Despite these findings, there are other areas of concern that have been identified by mental health professionals in the state. Perhaps chief among them is the abuse of illicit drugs and alcohol, which is prevalent in both adult and adolescent residents. The 2016 MHA study states that 10% of adults, and approximately 7% of young people display substance dependence. This state is ranked 47th and 46th respectively, for these two mental health measures, indicating a high percentage of residents affected. The Substance Abuse and Mental Health Services Administration (SAMHSA) reports from 2012-2013, 64.4% of teenagers in Colorado perceived no great health risk from drinking five or more alcoholic beverages once or twice per week; additionally, 80% of teenagers saw no significant risk in smoking marijuana once per month. Both of these percentages are higher than the national average. Residents experiencing addiction to illicit drugs or alcohol are encouraged to find a therapist or take advantage of local mental health resources such as drug rehab facilities, detox centers, or residential treatment centers in Colorado. While there are no guarantees that treatment will resolve these issues, many are able to learn effective coping strategies that may help improve their lives.